Queens made it two wins out of two following victory over Clyde in tonight`s Betfred Cup clash at Palmerston, and once again it was Stephen Dobbie who did the damage as his second half hat-trick secured a valuable 3 points which leaves Queens sitting top of Group G.The first half was fairly evenly matched with both teams having chances to score, but in a much improved second period during which Queens increased the tempo of the game, Dobbie`s clinical finishing proved to be the main difference. Fresh from Saturday`s win over Stranraer, Queens made just two changes to their starting line-up with Alan Martin replacing Jack Leighfield in goal, and with Kyle Jacobs missing through injury, loan signing Callum Semple made his first start. In a lively start to the game both sides had good opportunities to take the lead and Queens would have done had it not been for Clyde `keeper Blair Currie. 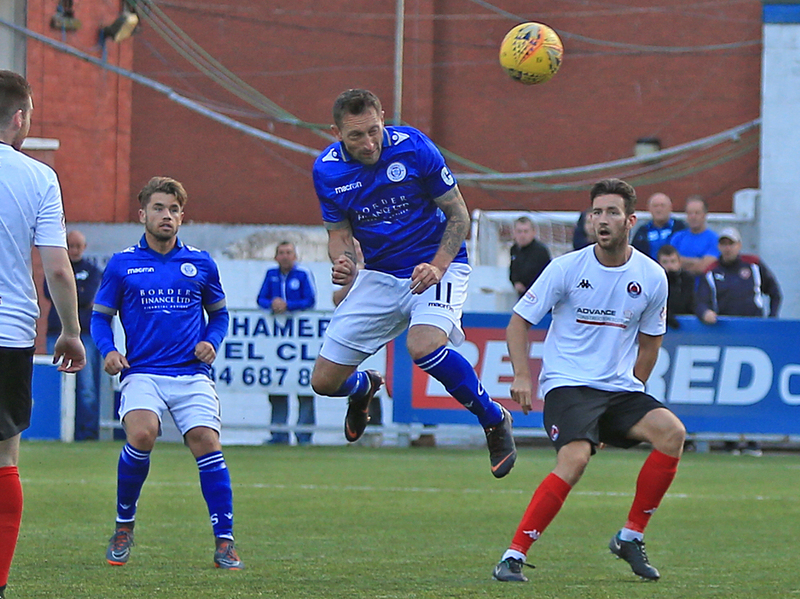 Andy Stirling found Stephen Dobbie 8-yards out in front of goal and although Queens top striker did everything right, Currie reacted superbly to push his effort round the post for the games first corner which was eventually cleared by the Clyde defence. The action then switched to the other end and this time it was Queens who received a slice of good fortune when Fearns ball across the face of the penalty area fell nicely for Love at the back post he could only guide his shot back across goal and against the base of the other post. 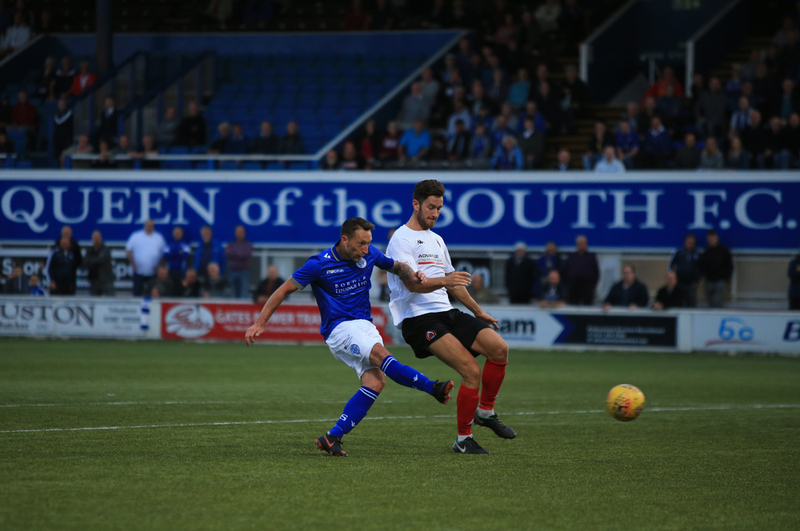 Queens were starting to dominate the game as you would expect, and the central midfield duo of Owen Bell, and Gary Harkins were having plenty of possession and were able to start several promising attacks as the home side looked for the opening goal. Michael Doyle was pushed into midfield following his debut at centre-back at the weekend and he was the next player to go close to finding the breakthrough as a `route one` attack almost pierced the Clyde defence. Alan Martin`s long kick was flicked on by Lyndon Dykes into the path of Dobbie and his first time ball sent Doyle breaking clear down the right and although the former Morton man got his shot away, it was too near to `keeper Currie who had covered his near post well and was able to tip the ball away. Just short of the half an hour mark Queens went even closer to taking the lead when an in-swinging corner from Harkins was met by the head of Dykes at the near post and his glancing header was hooked off the line by defender Stewart. The visitors had rarely threatened the Queens defence, but they went close to scoring minutes later when Goodwille was on the end of a cross from Love, but with the ball bouncing quite high up he was unable to control his header which flew harmlessly over the bar. A poor defensive header from Cogill gifted a chance for Dykes as the game moved towards the break, and although the striker`s first time effort was goal bound, his shot went straight into the arms of `keeper Currie. There was one final chance for Queens to take the lead before half-time when following a foul on Stirling wide on the left, a Harkins free-kick was flicked up onto the top of the bar before being kicked to safety by the recovering Clyde defence and the interval was reached with both sides having decent chances to take the lead but neither finding a way to break the deadlock. The half was barely a minute old when Queens almost opened the scoring. As the ball broke to Dobbie just inside the Clyde penalty area he tried to lob `keeper Currie who was well off his line, but although Dobbie succeeded with his effort the ball bounced off the post and back into the arms of the grateful Clyde shot stopper. 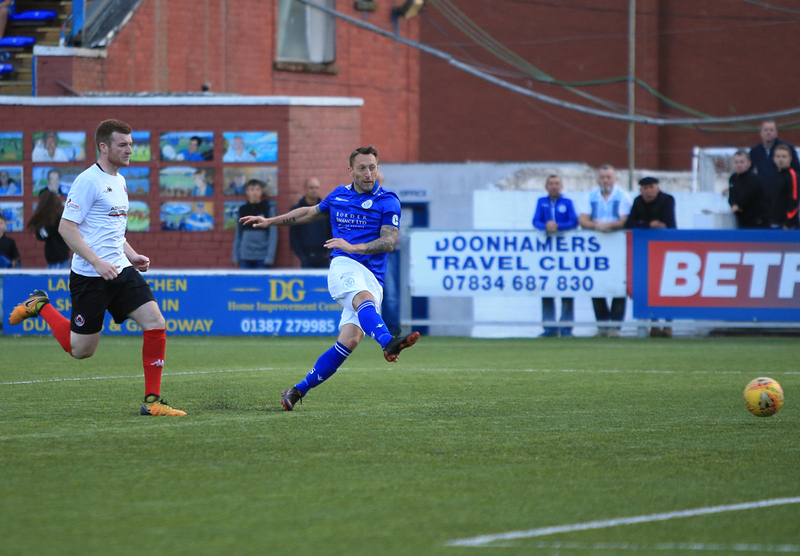 Just when it seemed as though it could be one of those nights, less than 30 seconds later, Queens did take the lead when a cross from the right was glanced on by Stephen Dobbie and the ball had just enough pace to cross the line. 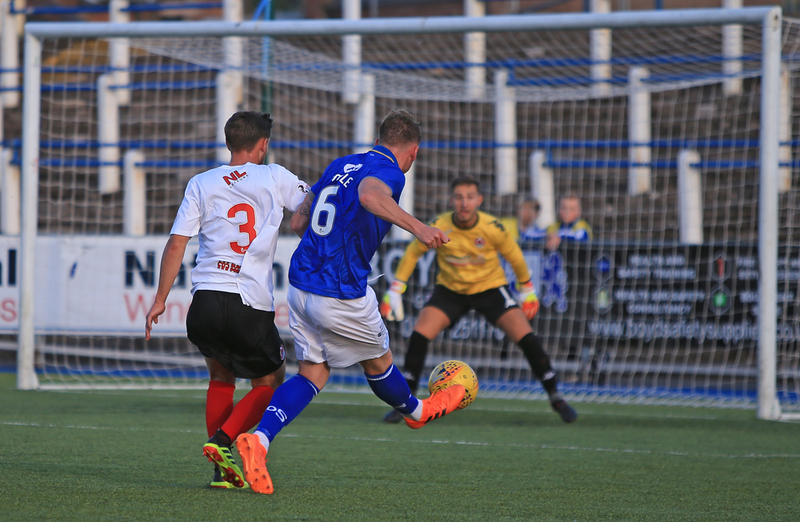 It was evident that Queens had upped their game, and one goal became 2 three minutes later when Stephen Dobbie scored his second of the night as he managed to stay onside and then end a 20-yard run with a fine low drive past Currie. Youngster Owen Bell became the first Queens player to be booked this season for a poor challenge just short of half-way, but that apart he had a very effective game and certainly looked more comfortable in his central role. Queens were in total control and would have added a third goal just before the hour, but once again Currie produced a brilliant reflex save to keep out a close range effort from Dykes after good approach play between Jordan Marshall, and Dobbie. The next Queens attack was led by a pacey run from Stirling breaking down the left, but that ended when Stewart hauled the Queens man to the ground to concede a free-kick. With Currie standing well off his line and to the left of his goal, Harkins audacious free-kick almost caught the Clyde `keeper out, but fortunately for him, he reacted very well to get back and turn the ball over the bar. The Clyde `keeper was certainly earning his money and it has to be said that he was having a much better game than his brother had whilst playing here for Stranraer on Saturday. Queens first change saw Josh Todd replace Owen Bell, and in a rare break an attempted chip from Goodwillie wasn`t good enough to beat Martin as the visitors looked to find a way back into the game. The same player went close again but his shot was deflected for a corner and after defending that set-piece well Queens almost scored again. A long ball from Dykes found Dobbie in space on the right and when his pass across the face of the penalty area picked out the run of Stirling it looked as though Stirling would round off the move by scoring, but unfortunately he was not able to bring the ball under control and the chance disappeared. 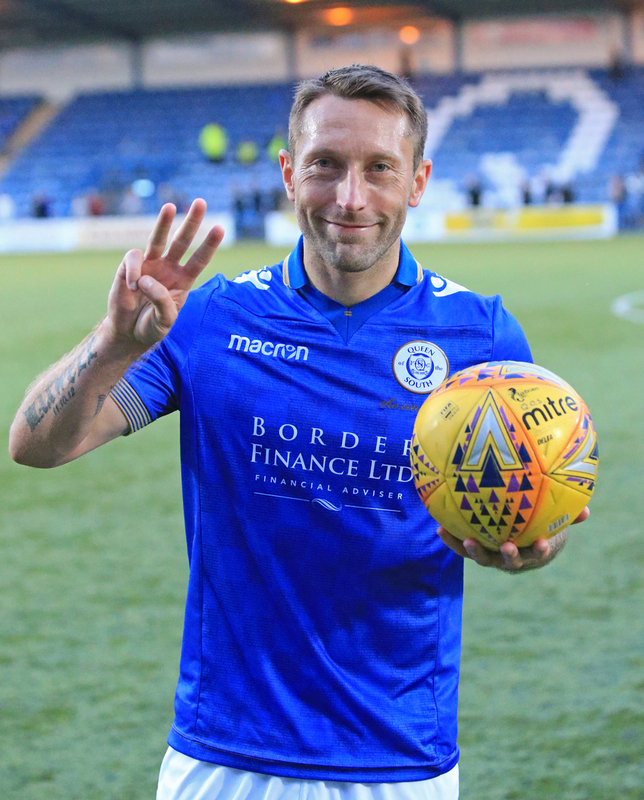 The game was well and truly wrapped up with 12 minutes to go when Stephen Dobbie got the break of the ball just outside the area and finished superbly well by drilling a low shot past Currie to complete yet another hat-trick for Queens. Lyndon Dykes was replaced by Connor Murray with 8 minutes to go, and moments later Queens really should have had a fourth goal but Stirling was given offside before he rolled the ball home- this was a very close call, it looked to me that Stirling was just onside, fortunately it didn`t matter. For the final few minutes Dean Watson was given his first team debut, coming on for Michael Doyle, and the last meaningful action of the game saw Gary Harkins skip past three defenders before he was sent tumbling in the box.It looked like a penalty, but referee Munro was unmoved, deciding instead to book Harkins for simulation. So in the end a comfortable win for Queens, but it wasn`t always as easy as the 3-0 scoreline would suggest.